The higher a leader’s core awareness level, the higher his or her chances of assessing the flashes of superior comprehension and vision that define great leadership. This book presents “cognitive technologies” for increasing leaders’ awareness and for boosting company cultures into more innovative, empathetic and energetic performance. There is a reason yoga has so many devotees — not only does it tone and strengthen the body, it also helps relax and clear the mind. Take that same idea and adjust it for the business world. The result would be Executive Genius, a book aimed at helping executives use the mind-body connection to think more clearly and creatively. Yes, the premise may feel New Age or perhaps even flaky to some, but the book asks the reader to withhold their suspicions. Authors John Selby and Ahmos Netanel encourage executives to try these extraordinarily easy techniques for two or three weeks — and experience the potentially remarkable changes. The first step is as simple as breathing. The authors encourage executives to take time to breathe deeply and focus on a mantra of their choosing. By following the breath from start to finish, the authors say an executive can take his or her thinking away from minute details or unimportant tasks. This frees the brain to rest, regroup and generate higher-level thoughts that may create unexpected solutions. Other techniques focus on the executive’s impact on the external world. An entire office’s behavior and performance can be positively affected if the leader is more alert, energetic and innovative, Selby and Netanel say. Leaders set the tone for the whole company — and this includes the emotional atmosphere. To ensure high performance among the greater staff, an executive needs to experience his emotions fully, try to balance them in the context of a business environment and present their team with a largely positive mood. Selby and Netanel’s method does not encourage deep emotional wallowing; rather, it asks leaders to touch base with the present through a review of what is in their hearts at the moment. Once they have come to an understanding of what they are experiencing, they can make the necessary adjustments to think positively for the good of the overall office. The authors’ insights come from experience. Selby is a psychologist, corporate coach and entrepreneur. He also has a background in cognitive engineering research. Netanel, who has an MBA, is the founder and CEO of Lucrative Wellness, a Beverly Hills, Calif., global business advisory firm serving the hospitality and health care industries. Raising your awareness of body and mind has a variety of business purposes, the authors say. For example, executives who are open to new ideas and can quiet their mind through relaxation techniques could improve their companies’ customer service. To that end, the authors encourage leaders to get out of the office and sit down with actual customers to learn what is happening on the front lines. Also, learning to control your own feelings and stress can attract better-quality employees to a business, thus improving customer service at another level. Overall, Selby and Netanel note that there are plenty of distractions and annoyance in today’s workplace, whether it is e-mail, text messages or an old-fashioned ringing telephone. These are the gnats of the business world, buzzing around an executive’s head and often getting in the way of bigger ideas and solutions. 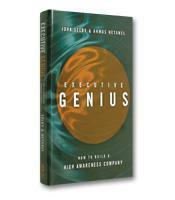 Executive Geniusasks leaders to touch base with their internal selves throughout the workday. Doing so will improve a company as a whole, both on the individual and systemic level. It just takes one sincere deep breath to get started on the right path.